Just what exactly is this development and why should you care? Because Precinct 75 is a miniature Portland in the backstreets of St Peters. It's where you'll find Maniax – an axe-throwing workshop where you can learn to chuck a tomahawk (hey – you know who you want to be standing behind, come the zombie apocalypse). It's also where you'll find the Design Twins, purveyors of beautiful, expensive pot planters and Sibella Court – she of the dusty apothecary bottle, deliciously rough linen and just the right tarnish on the brass. There's Sample Coffee roasters, Willie the Boatman craft brewers, a film studio, tiny design houses – truly, the spirit of 2016 is alive in St Peters. 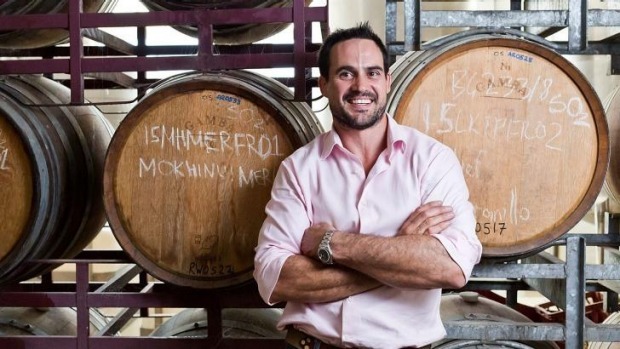 And now, Alex Retief has joined the fray, launching Australia's first large-scale urban winery. This isn't a new idea; we've had them on a slightly smaller scale before (the late Sam Hughes and the Natural Selection Theory were doing some very experimental wine things in their inner west digs, including regularly playing music to a series of clay eggs filled with wine) and they're massive in the US and Canada. London Cru, the city's proto winery, even brings its grapes in from Bordeaux. But this is the first in Australia to do it on a large scale. And really, could anything be more Precinct 75 than an urban winery neighbouring a design studio? Maybe. Because Retief, among the many things he has planned, intends to do collaborations with Rosebery craft distillers Archie Rose (it'll be a Retief vermouth to go with the signature Archie Rose gin) as well as a barrel-aged beer with Newtown's star brewheads Young Henry's. The whole precinct is in the old Taubman's building, which, although established in the early 1900s, became a virtual squat by 1960. Then in 2013, the place was given a power hose, and a plan was put in place to create a collection of like-minded businesses to revitalise the area. Much as Rosebery's The Cannery gave the south-west a new lease on life, so too does this collection of artisanal excellence. It was while he was living in Bordeaux that Retief first started thinking about having his own winery. "It was just that passion for regional local wines where we don't really see that in Sydney and NSW. That passion from the restaurants or the local residents for our local wines." The idea of something quite urbanised and city-centric started forming when Retief collaborated with the Bourke Street Bakery guys in Potts Point, and another in Surry Hills with Nomad. "It was really amazing seeing the locals' reactions to the winemaking process and being part of it," says Retief. "It just grounded the whole idea of having an urban winery where everyone can come along and just watch it or come and get their hands dirty if they want, or just sit with a glass of wine and see what's going on." The idea is something community-focused, interactive. The website will be a constant update of when the grapes are coming, how the harvest is looking and how members of the general public can become involved. The idea is that eventually it won't just be Retief's wine on show but a spectrum of what NSW has to offer. "I plan to bring sommeliers here on a regular basis to show what can be done," he says. Flash forward a year, and Retief wants his winery to be as much of a destination as a wine bar. "I want people to be playing backgammon, sitting here trying a glass of chardonnay and then being able to talk about it and saying how good Orange wines are," he says. "Because what I find really interesting about NSW regions is that they are so diverse within the one state. You have as big a difference as between Bordeaux and Burgundy from the other side of France as you do within Orange and Tumbarumba. We can make wines that are such different styles – all great in their own way – but varied because of the many regions and that's what people don't know." Urban Winery, 75 Mary Street, St Peters, aretief.com.au. Winery opens early March.